Chen Z. (2008). Roles of Arabidopsis WRKY3 and WRKY4 Transcription Factors in Plant Responses to Pathogens. BMC Plant Biology. Zheng Z., Qamar S. F. A., Chen Z., Mengiste T. (2006). Arabidopsis WRKY33 Transcription Factor Is Required for Resistance to Necrotrophic Fungal Pathogens. The Plant Cell. Xing D., Chen Z. (2006). Effects of Mutations and Constitutive Overexpression of EDS1 and PAD4 on Plant Resistance to Different Types of Microbial Pathogens. Plant Science. Chen Z. (2006). Functional analysis of Arabidopsis WRKY25 transcription factor in plant response to Pseudomonas syringae. BMC Plant Biology. Chen Z. (2006). Pathogen-induced Arabidopsis WRKY7 is a Transcriptional Repressor and Enhances Plant Susceptibility to Pseudomonas syringae. Plant Physiology. Chen Z. (2004). Activation of Hypersensitive Cell Death by Pathogen-induced Receptor-like Protein Kinases from Arabidopsis. Plant Molecular Biology, 56, 271-283. Chen Z. (2004). Differential expression and distinct functions of pathogen-induced WRKY transcription factors from Arabidopsis. Molecular Plant-Microbe Interactions. 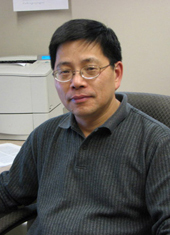 Chen Z., MacFarlane S. A. (2003). Analysis of the involvement of an inducible Arabidopsis RNA-dependent RNA polymerase in antiviral defense. Molecular Plant-Microbe Interactions, 16(3), 206-216. Chen Z. (2003). Expression profiles of the Arabidopsis WRKY gene superfamily during plant defense responses. Plant Molecular Biology, 51, 21-37. Chen Z. (2003). Potentiation of developmentally regulated plant defense responses by AtWRKY18, a pathogen-induced Arabidopsis transcription factor. Plant Physiology, 129, 206-216.